General Motors will become the third and final of Detroit’s “Big 3” to establish a diesel platform for their half ton pickup line. In fact, GM’s new diesel for the Chevrolet Silverado and GMC Sierra will also become the third 3.0 liter diesel in the segment – both Ram Trucks and Ford Motor Company offer a 3.0L diesel in their respective ½ ton models. The 3.0L Duramax will be unique in that it will be the first and only inline engine in its class. Note - this page is currently incomplete and information will be added as it is released. The 3.0L Duramax will produce a peak 277 horsepower and 460 lb-ft of torque. Peak torque is produced at a low 1,500 RPM, suggesting an engine with a relatively long stroke and/or undersquare bore-stroke ratio. However, peak horsepower is produced at 3,750 RPM, which is relatively high for a long stroke, I-6 turbodiesel. Both the 3.0L Power Stroke (Ford F-150) and 3.0L EcoDiesel (Ram 1500) are only slightly undersquare with a bore-stroke ratio of 0.93 and 0.91, respectively, and reach peak horsepower at marginally lower engine speeds. While this isn't necessarily a point of benefit nor disadvantage to any of the three engines, it sparks curiosity nonetheless as we await the actual dimensions of the new Duramax. GM has a history of employing oversquare diesel engines (6.2L, 6.5L, 6.6L), challenging the norms of heavy duty diesel engine designs. However, inline engines are typically undersquare to compensate for packaging restraints in the design and yield greater torque outputs at lower engine speeds. 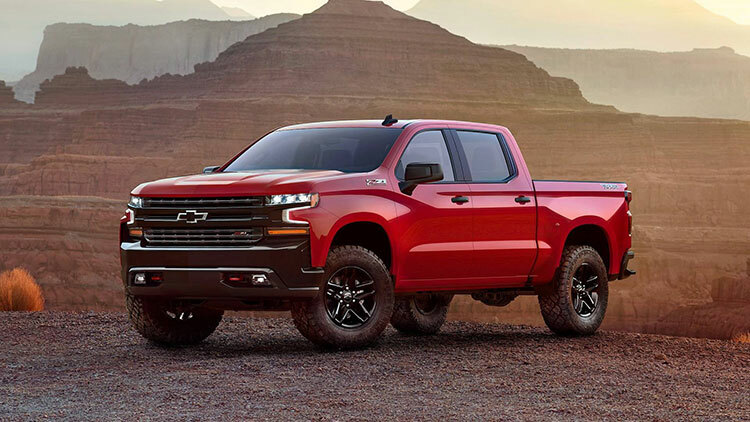 At 460 lb-ft, the 3.0L Duramax is rated at the same peak torque as the larger 6.2L V-8, although the gas V-8 comes with a 420 horsepower rating to the Duramax's 277 (based on 2019 6.2L equipped in the Silverado and Sierra 1500). There's been some assumptions that GM's inline 6, which is exclusive in the 1/2 ton segment, is based on the architecture of the 2.8L I-4 found in the midsize Chevrolet Colorado and GMC Canyon. However, the two engine platforms will not share the same bore and stroke; taking the 2.8L engine's bore and stroke combination and adding two additional cylinders results in an engine that displaces roughly 4.2 liters. Thus, the engine may use the 2.8L's stroke length with a smaller bore diameter or the 2.8L's bore diameter with a shorter stroke length, but they will share the exact same combination. GM will compete head-on with Ram’s 3.0L EcoDiesel and Ford’s 3.0L Power Stroke V-6 engines. For the 2018 model year, the EcoDiesel produces 240 horsepower and 420 lb-ft of torque while the Power Stroke is rated up to 250 horsepower and 440 lb-ft of torque. Both engine platforms have earned EPA fuel economy ratings at or near the 30 mpg mark and the Duramax equipped 1500's are expected to competitively encroach on these figures. The 3.0L Duramax is backed by a 10 speed automatic transmission that was developed through a cooperative with Ford Motor Company. To General Motors, the transmission is the Hydra-Matic 10L80. The transmission features a 1 piece aluminum case (integrated bell housing) and weighs in around 230 lbs fully assembled; relatively light for a transmission that features ten forward speeds, three of which are overdrive ratios ranging from a moderate 0.85:1 to a tall 0.64:1 that is favorable at highway speeds and will greatly contribute to the powertrain combination's fuel economy ratings. The transmission has a maximum input torque capacity of approximately 590 lb-ft, making it suitable for a variety of GM engines. Note that not only does the transmission feature 3 overdrive ratios to select from, it's 1st and reverse gears are relatively low, providing excellent torque multiplication for low speed, high load maneuvers. The small steps between gear shifts, specifically in 3rd through 10th, allows the transmission to bring the vehicle up to speed with less effort while keeping the engine in its ideal operating range for efficiency and performance.